I just finished this beautiful story by my favorite English teacher, Ellen Mulholland. 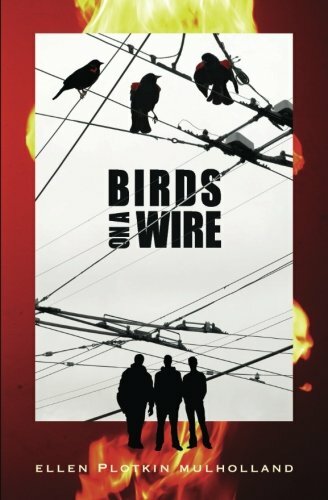 “Birds on a Wire” tells the story of three friends (Matt, Miguel and Jesse) who’ve known each other their whole lives but only recently learned some new truths. Miguel is the Romeo of the trio, but he’s also lost in his struggle to please his immigrant parents and become a soccer star while still supporting them with his side job at Al’s Gas Station. His hothead gets him and his friends into serious trouble. Jesse loves Ruby, but Ruby’s found a new fella. It’s this little problem that brings Matt’s story out from behind the curtain. Matt has fallen for someone, too, and Ruby decides it’s her job to tell his friends. That’s a problem, and that’s when it all comes out. Literally. This is a story about friendship. It’s about how boys handle love and family and the truth. As a girl, I found it touching and honest. If you are looking for a story about real people, real teenagers, “Birds on a Wire” might just be the one. After all, what’s more important than friends, family and being real? I highly recommend this book to all mature boys and girls ages 14 and up.